You might know me as City the Kitty’s mom, but what you might not know is that in addition to taking care of a famous cat, I have another career. For the past 8 years, I have been covering news, features, and sporting events for United Press International, Associated Press, and Reuters. I uphold the highest standards of journalism when I am covering events. What I am about to describe to you has all the integrity and backing of any major news story. Simply put: I have all the proof. I’m excited to share with you the results of my latest investigation into the state of cat declawing in New Jersey, including the myths and the truths. As many of you know, there is currently a bill that would make cat declawing (onychectomy) illegal in New Jersey, so this is one of today’s hot topics. As I work tirelessly to bring an end to this inhumane thing known as declawing, please continue to send me your feedback and stories — City the Kitty and I are blessed to have such wonderful readers and followers. My team and I worked on this detailed investigation for over a month, to bring you the truth about how declawing is addressed in veterinary practices in New Jersey. 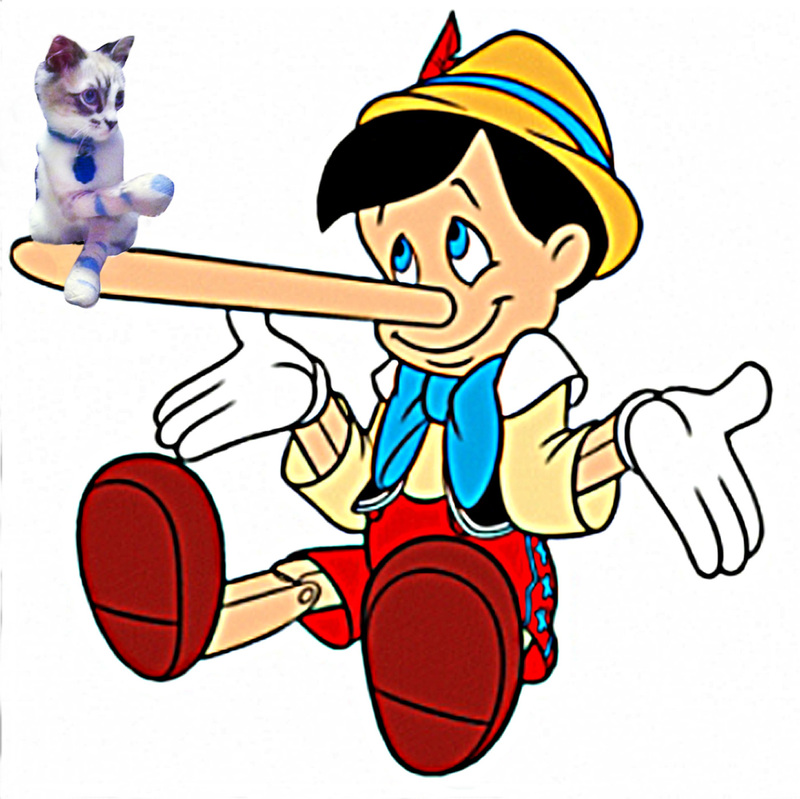 We had been informed of numerous veterinarians perpetuating and spreading false information to their patients and to the public about declawing, while concealing the truth. We had been informed that these falsehoods were being spread by businesses who profited from or had financial interest in performing declaws. We made calls to survey 110 veterinary practices in New Jersey, including the practices of the New Jersey Veterinary Medical Association (NJVMA) President and board members. In some cases, we made multiple calls to the same practice. The practice was called by an investigator posing as a cat owner (most commonly a first time cat owner) who was adopting a young kitten and needed it spay or neutered. This cat owner also asked about getting an older cat declawed. The “cat owner” had concerns about the declawing procedure and asked for a vet who was skilled at declawing. The “cat owner” asked if it was a regular and routine procedure that the vet does and also asked if the practice did more than one declaw a month. There were a few variants on the questioning, but essentially the investigator asked the veterinary professional on the phone about the side effects of declawing as well as the frequency with which the vet performed declaws. We have withheld the names of employees for fear that they might suffer a backlash for their honest answers. We have provided just a small sampling of the audio from the taped recordings of our study. or on a regular basis and more than one a month. very few or not often. 7% wouldn’t say how many they do. Only 12% offered or suggested alternatives or asked why the cat owner wanted to declaw his or her cat. These results directly contradict the testimony of the NJVMA before the New Jersey Legislature. Here are the myths from the NJVMA, along with the truths that we discovered from our independent and detailed investigation. MYTH #1: The average practice in NJ does fewer than 9 declaws per year. FACT: Our investigation revealed that of the practices that declaw cats, 72% performed multiple declaws each month, which would average a minimum of 24 a year. 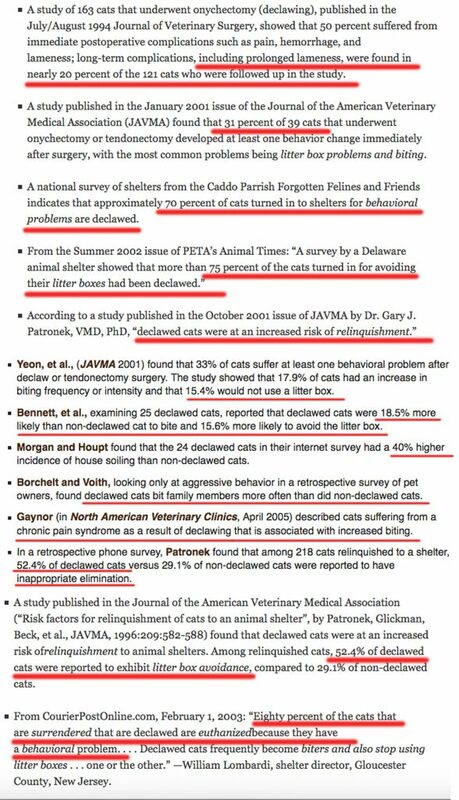 This 72% or 70 practices (out of 97) stated they perform declaws “routinely”, “commonly”, or “frequently”. Some vets even said they do several per week, which would add up to over 100 per year. 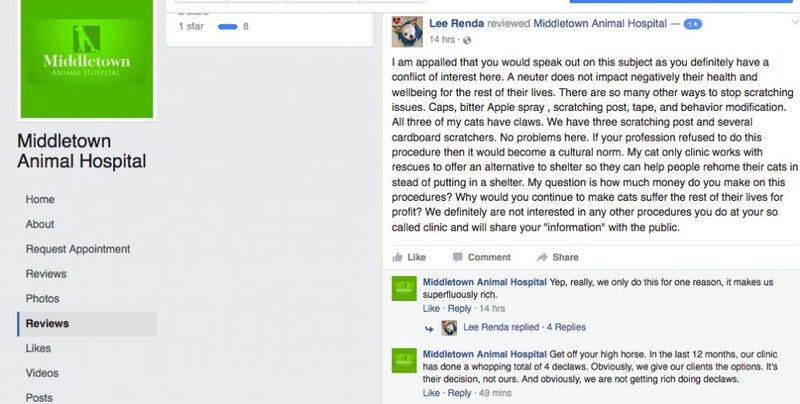 At least one vet said declawing is “as common as spays and neuters” at their practice. Screenshot from Middletown Animal Hospital facebook page review on Dec. 7, 2016. They say the did 4 declaws in the last 4 months yet Dr Yurkus’ said that his practice has done 2 this year. MYTH #2: NJ veterinarians “try to suggest every other alternative (to declawing) first”, and declawing is only offered as a last resort after all other methods and education have failed. FACT: Our investigation revealed that only 12% of NJ practices who declaw cats offered or suggested alternatives or asked why the cat owner wanted to declaw his or her cat. To the contrary, most of the vets promoted how good their doctors were at declawing, how many they have done, or how good their technique or tool works for declaws. Stay tuned for another round of myth-vs-fact next week! WANT TO HELP US SEE THIS BILL TURNED INTO LAW? Please follow the Paw Project and Love All Cats NJ on facebook, instagram, and twitter. 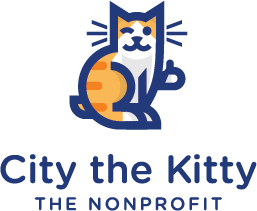 We all will be posting important updates and call to actions so you can personally help protect kitties paws.